Geek Lit Etc. : What hunts bats? For generations, the Wayne family has watched over Gotham City. Both figuratively, from the top of the original Wayne Tower, and literally. One would think that Gotham would be grateful of its protector and philanthropist, and most are. But as always, there is always two ways to view history. 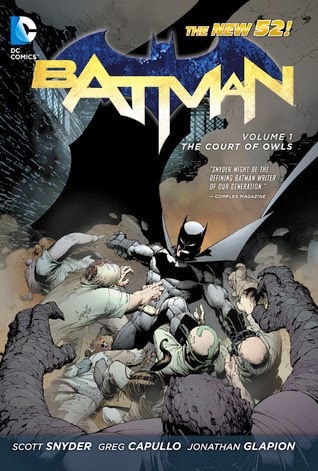 In Batman Volume 1: The Court of Owls, we get to learn about the history of the Wayne family in Gotham City. In the 1880s, Alan Wayne built the original Wayne Tower, and designed it in a way that visitors would feel protected by it. Towering over Gotham's Union Station, the gargoyles perched on its upper levels both watch over and welcome the residents of the city. Bruce's parents were also not the first to die in a tragic way. Alan Wayne's body was found in the sewers after he disappeared. Tragic, but not necessarily unexpected, since he'd been declining mentally for a while. Becoming more and more paranoid about owls, he seemed to be falling farther and farther into his delusions, until one night he fell into a manhole while fleeing from his imaginary tormentors. But what if his demons weren't imaginary? What if the owls that he was so sure were stalking him really existed? What if the owl's nest that a young Bruce Wayne found after the death of his parents wasn't a coincidence? The speech that Bruce makes near the beginning of the volume encourages Gothamites to look forward; to envision what Gotham City can become, rather than dwell on its past or present. The danger in that, though, is that sometimes the past can come back to haunt you. Highs: Seeing the entire Batman family come together while Bruce is indisposed shows that Bruce is hardly alone anymore. Lows: Since I'm not a regular reader of DC superhero comics, it's hard to tell how much of this is new revelations and how much is part of the decades of Batman cannon. Verdict: A fascinating look into Batman's past, and an ending that demands the next volume be acquired immediately. Is a different view of the world wrong? Do you believe in love before first sight?